We need to talk. I do love your DVD, Game and Blu-Ray service it is great. However your streaming service whilst a nice extra does not look like a winner against a truly competitive alternative. If you don’t get the quality up and the variety up you may find one year a mass exodus to NetFlix. Get a deal with Crunchyroll or Manga or who ever and get streaming Anime. Especially simulcast. This will get a small, but very vocal voice shouting your corner on the internet. Thanks to Mark Aberfan (Aerials) on Join Fresat he put me right by pointing out a new firmware update for the Echostar HDS-600RS. well my Echostar started failing to record series link shows. First it disabled series link altogether. Then I switch it off and then on. It then showed the series link icon, but then failed to record beyond the first recording. I have tried: Factory Reset, reinitialising the drive and a firmware update. I’ve lost all of my recordings and it’s no better. 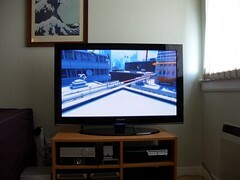 I am less than impressed with Echostar, compared to PS3 PlayTV and even my mates sluggish TIVO this thing is slow. I can’t imagine how slow other devices are if this is considered fast. It could be that it was second hand, but when it did series link properly it at least allowed to to just watch the shows I wanted with as little time in the interface as possible. I have made no efforts to hide my disappointment after seeing the Star Trek reboot at the cinema. I really didn’t like it. However in an effort to be fair after my recent revisit of the other films I sat down and watched it again. Taken as entertainment it is ok. I found it to be a bit like an American kid’s cartoon or Transformers 2, frenetic and a bit much. Nothing has space to breath, all ideas good and bad seem to be chucked in to fill airtime. For it’s time the Star Trek series did try to step things forward, moving beyond the pulp Science Fiction of Flash Gordon and building on the work of the Forbidden Planet. You had an international, interracial, intergalactic and interspecies crew. Bare in mind the controversy at the time of a Russian on-board and a female officer on the bridge. Old Star Trek had gotten stale. It was by the numbers and re-treading old or unwelcome ideas. I think I was hoping something on a par with the BSG reboot with more mainstream appeal. 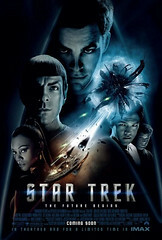 Film Four recently showed the entire run of original Star Trek films. That is to say the original universe, not the reboot by JJA. I’d like to give my thoughts on them, please bare in mind I am not a Trekker/Trekkie or a critic. Often jokingly called The Slow-Motion Picture, this is a somewhat successful attempt at taking Trek to a higher brow. I like TMP, it is flaws are balanced out by its audacity. It did spawn the series and TNG. Originally it was going to be an all new crew, but Kirk & co were shoehorned in. Right from the start the Star Trek films focus on people passed their prime, but still willing to give it a go. Maybe in the 23rd century people aren’t over the hill by 40? Bald women ftw 7/10. Awesome band by the way. I went into Avatar with low expectations. I expected the story to be unoriginal and 3D to be annoying. The funny thing I wasn’t wrong. However it turns out if you take off the shelf ideas and mix them together, like a good DJ set, it doesn’t matter. 3D is annoying or rather would be annoying for most films, but for blockbuster Sci-Fi or animated tales it has it’s place. I can happily see myself going to see maybe a film a year in 3D (Tron Legacy in 2010). Avatar is essentially a gaia anime story combined with Dances with Wolves. It’s what you would get if you got the Macross team (Macross Zero) or Bones (Eureka 7) to develop a Ghibli film (Laputa) for the western market. This is no bad thing as I loved all of the above and frankly if it opens peoples minds enough, maybe a western friendly anime series might *just* get their interest. 3D is not the saviour of Cinema. It is as it was every other time, a gimmick. The 2009/10 version is a more polished gimmick, but it is still what it was before; interesting for a few key niches, but at best unnecessary at worst distracting for anything else. My only worry is that Hollywood will strip mine the 3D Sci-Fi/animated tale blockbusters until even the hint of space or a pixar-like film will have people running for the hills. This could do major damage to genres I enjoy. As for 3D at home, anyone who invests in that is an idiot of emperors’ new clothes level. Also Windows Live Writer is sooo good. I went to see Star Trek yesterday evening with my friends; John, James and Susan. I’d like to put some reference in here for you. John is a fan of Batman and Star Wars, so tends towards preferring Science Fantasy or Comic Fantasy. James is a huge Star Trek fan, it is pretty much the base of his Science Fiction fandom and I would like me grew up with TNG. Susan I guess to a lesser degree, but I guess prefers Science Fiction. I prefer good Science Fiction, but Fantasy of any type can go down well. Now I’d like to state what I hope Star Trek is at its best, which is good science fiction that makes you think, but that is palatable enough for the general public, Inclusive Science Fiction if you will. A lot of this inclusion comes from believability based on continuity and science that works by stretching, but never breaking the rules. In many ways this is what recent remakes like BSG and the Batman movies have succeeded in. Taking out the unreal-ism and treating your audience with respect. If you think how old BSG was, it felt a lot more like Star Wars than Star Trek. Out of the four of us I believe John enjoyed the new Star Trek the most and James the least. Now taken as vacuous entertainment ST is pretty good, the effects are shiny and the explosions loud. However once my brain came out of sleep, I really didn’t need it to watch ST, stink set in. It is bad science fiction, with plot holes larger than the black holes in the film. Most notable is the extreme variability of speed in the film. I don’t want to spoil it for those that haven’t seen it, so please look away now. So an experimental 24th Century Vulcan high-speed ship can not get to Romulus in time and a Federation ship is too far away to call for help whilst under attack. However a 23rd century ship can get to Vulcan in about 10 minutes flat and get soo far away from Earth a huge black hole can cause no harm to the planet or system. That’s just the blindingly obvious. I won’t go in to the rest of the insane plot holes as, unlike this film, I won’t insult your intelligence. A complete lack of strange new worlds and civilisations. Time Travel fixes/breaks everything, please bare in mind Time Travel was initially invented for a semi-comedic Star Trek film. It was not designed to be used all the time. Space Invaders level film plots. Nemesis and this film share so much in common it is scary. Being embarrassed to be Star Trek. Feeling like they are on the Final Frontier and not just 10 minutes from the safety of earth. Screwing up the canon for no good reason. Canon changes are welcome for the good of the series, not just because we can. What we are left with if analogized as Batman; is a Batman with super powers, no interest detective work and half his family are still alive, but oh he still wears the right suit. It is the skin of a Star Trek on Star Wars as directed by Michael Bay. Frankly it is sad that Hollywood won’t fund new franchises as JJ Abrams obviously wanted to make The Fast and The Furious in space, which is what this is, what it isn’t is Star Trek. The Yamaha TSS series (TSS-1, TSS-10 & TSS-15) is a funny home theatre set to bracket. These days you usually get HT setups in 3 manners; PC 5.1 with no decoding, all in one DVD set or a real separates system. Now imagine a very small niche in the center of these three where the Yamaha TSS (and Sony HT-BE1) resides. It offers decoding and multiple inputs like the seperates system, the one box solution like the DVD set and the affordability of the PC 5.1 set. It is not as powerful as a lot of other systems, but for a small living room or second room system it is ideal. The sound is good, if not amazing, but still far better than the tat they call speakers in 99% of today’s TVs. Each of the TSS series have a healthy selection of inputs, the TSS-15 is by far the best offering two opticals, one digital coax and dual phono inputs. The TSS-10 which I have lacks the coax. This is still enough to input from a PS3, 360 and Wii without changing a single cable. For the record I only own a PS3, but for serious gamers this might be a good bonus. I have have found the TSS-10 to be easy to use and setup, its small speakers have integrated wall mounts. The remote is a simple as it gets. It supports Pro Logic, Dolby 5.1 and DTS for the stunning ebay price of £25. Frankly if you have spent hundreds on your new HD telly, why not pay up and get a wee system like this to help you enjoy it all the more.